On August 3rd, I embarked on a short-term journey. I have mildly struggled with digestive issues, both while running and in general, for quite a while now. I had played around with my fluid intake, adjusted my nutrition, cut out processed sugar, and monitored my diet in the days prior to long runs. All of these steps provided me with limited success and increased comfort, but many of the issues remained. Those ugly “runner’s trots” still emerged, undeterred by my attempts to vanquish them. I had to be missing something. There was clearly more I could do to adjust my daily habits. For more than a year, our household has been mostly gluten-free and dairy free (we still cheat a bit on the dairy, but we are both suckers for really good cheese…can you blame us?). However, there is no cheating on the gluten for the beautiful epicurean. I’ve still managed to consume limited amounts of gluten, mostly in the form of whole grain breads, cereals, and my ever-expanding taste for quality micro-brews! It’s been interesting to watch the change in our lifestyle as we adjust our shopping and cooking habits. Foods that had been tried and true staples for us went by the wayside, and were replaced with ingredients neither of us had much experience with, whether it be cooking or eating. Luckily, the epicurean has a culinary gift (as if the name wasn’t a giveaway), so she has poured herself into the task of learning how to craft amazing gluten-free meals, and embrace the anti-inflammatory that keeps most of her Sjogren’s-related pains at bay. As I was saying, our home has been free of most gluten and dairy, but I always consumed just enough on my own to never really know if it was impacting me. Since I still had no solution for my GI troubles, I decided to go on a gluten-elimination diet to see if that was indeed causing my issues, as gluten intolerance manifests itself in similar ways quite regularly. Ok, so I didn’t so much “decide” to attempt this elimination diet as the epicurean strongly suggested it over the course of a few months, and I finally, begrudgingly, gave in. 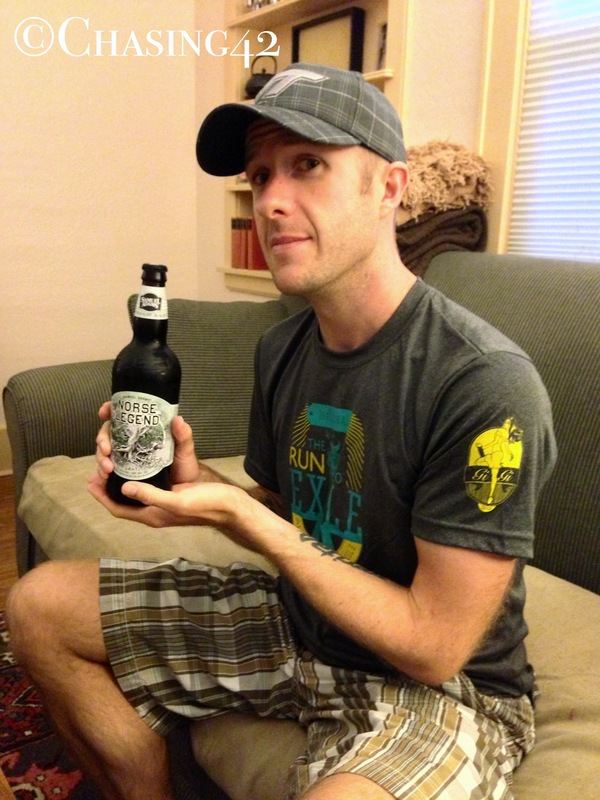 I suppose it was a testament to my commitment to running that I was willing to give up bread and beer, right? Prior to my dietary experiment, I thought I had a pretty good sense of the struggle that the epicurean and others forced to eliminate gluten go through. I had been with her for every meal, watched the early despair as realization after realization emerged with regard to foods she could no longer eat. I watched her strength as she adapted to a new way of life and adjusted her passion for cooking to accommodate her new restrictions. I was wrong. At the end of every day during that period, I went to bed still being able to eat that sandwich, muffin, or pastry. I could still select new beers to try. When I was alone, I could still walk into just about any restaurant and find something on the menu to eat. I’m not naive enough to think that the last 5 weeks of gluten-free living provide me with a full understanding of a lifetime of avoidance. However, being in a position to need to make those choices for myself has given me a deeper understanding and greater appreciation for the experience as a whole. My transition could have been much more difficult, but I luckily have a supportive partner who understands both gluten-free living, and my commitment to running and my health. However, this dietary elimination experiment still reared it’s head at the most random times. It would catch me off-guard when I would be out with friends have realize at the last second that I couldn’t eat something or drink something. I spent even more time at the grocery store reading labels, searching for substitutes to my staples, and putting items back on the shelf after I realized I couldn’t eat them anymore. I ended up craving meals that I rarely thought about before. I am much more aware of choice than I was before. After 5 weeks, my system had been cleared of gluten for the most part, and it was time to test my body. A few days prior to my planned gluten splurge, I inadvertently ate a malted-milk ball, not even thinking about the fact that it had gluten in it (malt)! I did, however, figure it out when my stomach quickly started churning, and I started sweating and feeling nauseous. This was not a good sign! However, I was going to stick to my plan and not jump to any conclusions. On the Sunday following my birthday (with Monday being a rest day), I cracked open a delicious bottle of small batch Sam Adams that I had been saving. Not only did I enjoy that beer more than I had any beer in quite a while, but I was keenly aware of that fact that it may be the last beer I ever have (yes, there are gluten-free beers, but they are a work in progress, to be sure!). After a few hours, I didn’t feel any different. The next day, I was still feeling fine. Perhaps gluten is not the culprit after all? If it was going to be my last, it was going to be good! I’ve had gluten only one other time since that beer, again with no reaction. However, I’m still not entirely convinced that it doesn’t have something to do with my bodily concerns. I haven’t felt overwhelmingly different, but there has been a slight increase in my “comfort” on long runs. I’ve also recently noticed that Gatorade, even in small amounts (when given by others), is too much sugar for my stomach to comfortably handle in addition to my honey stinger chews. I shall indeed stick to water and electrolyte tabs. So, at the end of this interesting experiment, I may not have a concrete solution to the questions I sought out to answer. I’ll keep experimenting. What I do have is an even better appreciation for the effort and energy my partner puts into her diet and the food we eat. 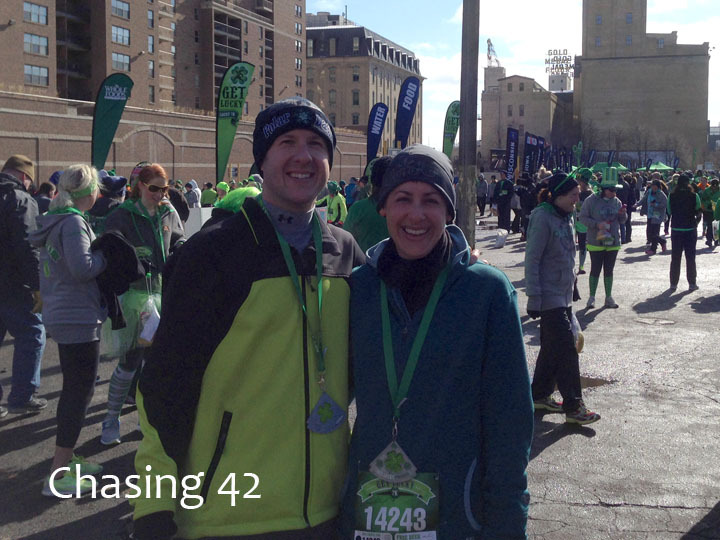 Her strength, commitment, and adaptability inspire me on a daily basis, and I’m happy to know that we signed up for this endurance event together! I don’t claim to be an expert when it comes to gluten-free eating, but I’ve learned quite a bit over the past year. In large part, that has been the result of tagging along on the beautiful epicurean’s dietary adventure. As I’ve learned more about it in general, I’ve found myself giving more thought to the role it already plays and could potentially play in my training. Just as gluten sensitivity, gluten intolerance and full-blown Celiac’s Disease diagnoses have exploded in recent years, so too have the products marketed at those living with these conditions. I find it very interesting that these products typically find their way into the health food section of most supermarkets. They have been quickly embraced by the health-food community, and folks have flocked to adopt a gluten-free diet without much information on the overall benefits of these products. As I’ve indicated before, I have fully embraced many facets of a healthy diet, and I continue my quest for the perfect running fuel to sustain me during longer and longer distances. As such, I’ve made it a point to keep my mind open to as many new nutrition products as possible in the hopes that one of them will provide that perfect energy! 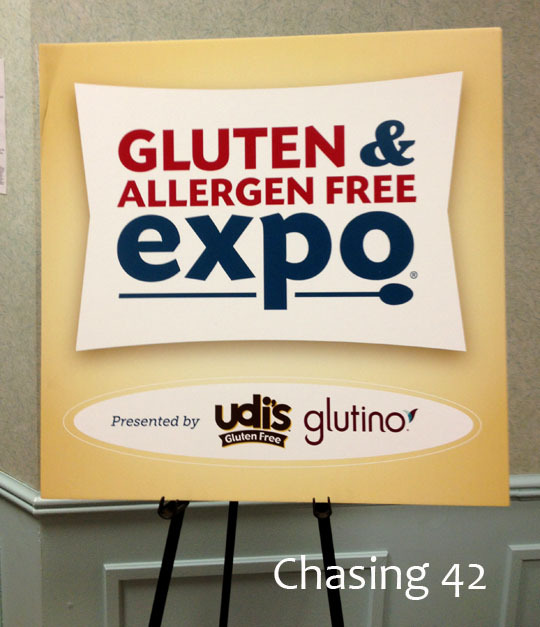 Enter the Gluten & Allergen Free Expo. 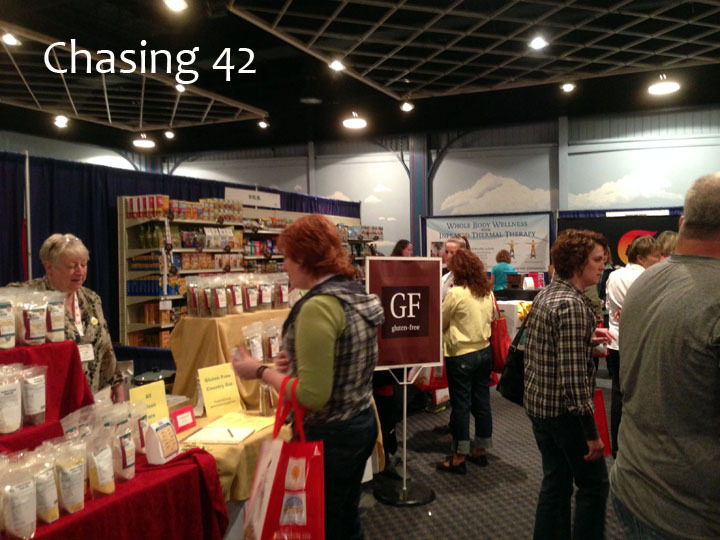 These events, which are being held across the country, bring together food and natural health product vendors from across the country, all hoping to make their mark on the gluten-free demographic. We had read about the expo several weeks ago, and were already planning on going when we entered a drawing at our local grocery store for free tickets. As luck would have it, we both won a ticket, so we were able to attend the expo as guests of HyVee! After driving around for a bit more time than either of us had patience to accommodate, we found the expo nestled in a convention space that was located on the grounds of an amusement park of some sort. 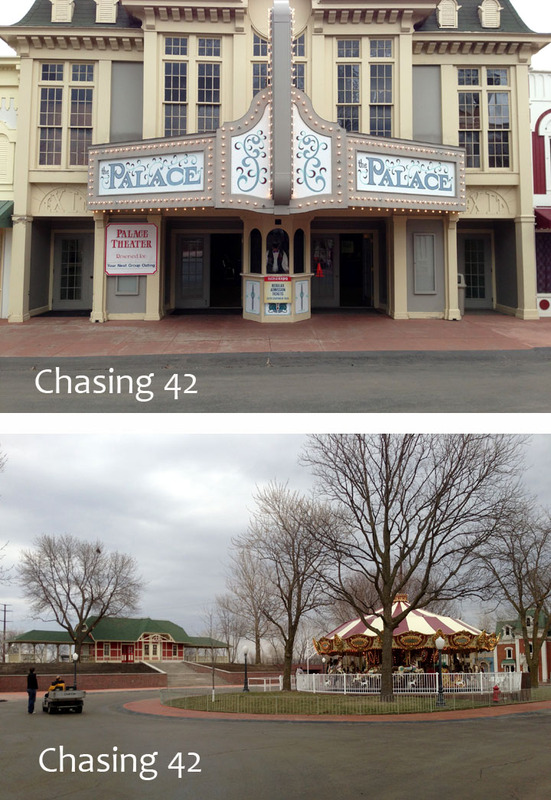 After living in Iowa for 8 years, I’m sure I’ve heard of the park before, but I really had no idea what it was, and it proved to be a strange cross between a wild west ghost town and Pleasantville. 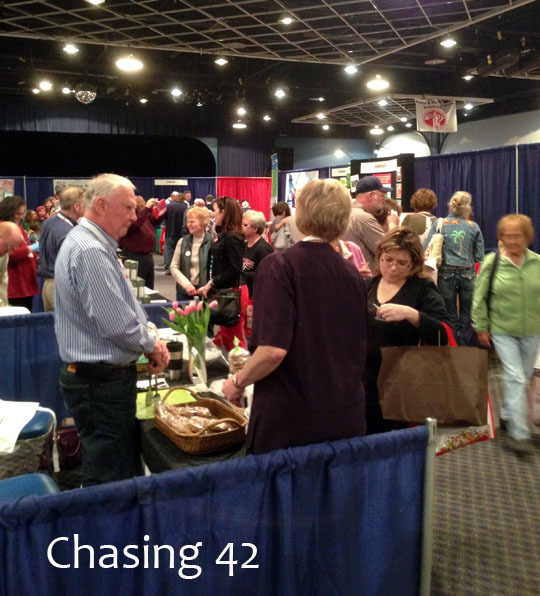 There were over 100 vendors on hand to display their wares, so we had plenty of exploring to do. While walking around and sampling food, it was refreshing (especially for the epicurean) to be able to casually taste all of the samples without worrying about the gluten content. We tried everything from soup to beer, although a large majority of the vendors were showcasing various baked goods and mixes. What was fairly consistent among the vendors was the reality of processed food. Now that I’m looking more intentionally at gluten-free products while shopping, I’ve increasingly noticed just how similar the products really are to everything else on the shelf. Stores are placing gluten-free products in health food sections and marking them as such, but they often contain just as much processed sugar as their gluten-laden counterparts. Now, I will definitely say that a larger percentage of these products are going to be better for you overall, but I have no doubt that as the demographic increases along with diagnoses, I will see more and more gluten-free versions of the same foods I avoid already. Part of the difficulty in trying to flush out the role of gluten-free products seems to be the marketing and regulation of gluten-free products in the food industry. The FDA has been discussing how to regulate gluten-free products since 2005, and is just now reaching a conclusion on industry standards that they can enforce in content and labeling. They have been holding open forums and inviting feedback and questions from the public, much like they do with other new regulations they are considering implementing. It looks like they are going to settle on a designation of 20 ppm as the threshold for a product being labeled gluten-free. Many products claim to have far less gluten than this, but the scientific testing hasn’t advanced far enough for these claims to be substantiated. In addition, many products right now may indeed be free of wheat gluten but still contain rye or barley gluten. The choices for consumers have never been more difficult! There are currently two organization, the Gluten Free Certification Organization, and the Celiac Sprue Association, that certify products as gluten-free, so looking for their logos can give you some indication that the product has been tested for all possible sources of gluten, including vague classifications such as artificial flavorings. 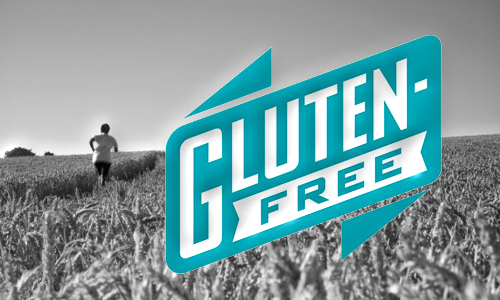 Now, much like so many other subsets of the population, the running community has been swept up in the gluten-free discussion as well. There are countless recipes out there for gluten-free nutrition, energy sources for runners, and post-workout meals. In addition, gluten-free living is being linked to cleaner eating, and vegan diets more and more. Although these are not the same thing, there are some connections. Amazing runners, such as Scott Jurek and Rich Roll are making this healthy diet trend that much more compelling! However, if you don’t suffer from CD or Gluten-Intolerance, then simply giving up gluten but continuing to each processed foods is not going to aid your running performance. Nutritionists will still tell you that a diet of fruits, vegetables, nuts, and grains is important for energy, endurance, and recovery. In addition, the stories I read about ordinary runners who are cooking and eating gluten-free tend to all have something else in common- healthy, fresh foods, and a lack of processed sugar. In the end, the expo was a good reminder for me that eating healthy isn’t simply a matter of buying the right products. I certainly enjoyed hearing more about a host of products I had never tried before, and we walked away with quite a few samples to try. Choice is everywhere in our lives, and eating healthy needs to be a part of a healthy lifestyle, which ultimately permeates everything I do. The increase in gluten-related sensitivities will certainly continue to play a significant role in the health of our population, as well as the products we consume. For those individuals that are forced to adjust to these changes, the influx of gluten-free products is definitely a positive sign of increased awareness on the part of the general public. As with most things, however, increased choice and increased access to information means being a responsible consumer is that much more important. Running clean will always be more than simply what you eat. Running clean is about how you live! 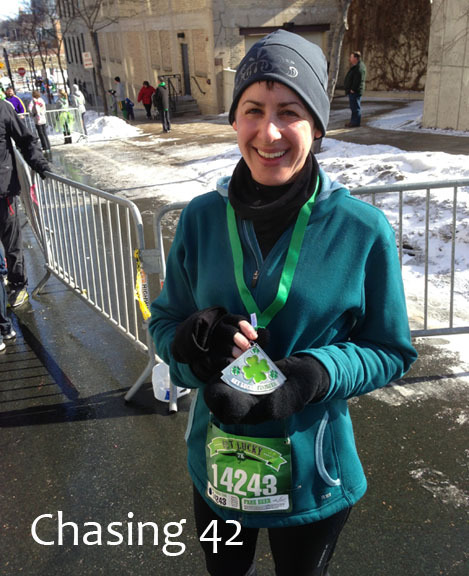 Apparently the luck of the Irish is strong with me, because my running pursuits have now resulted in me “Getting Lucky” twice just this month! Although most cultural traces of my Irish identity have been absorbed by my now White identity, I still have a soft spot in my heart for Ireland, and hope to one day trace my ancestry through the rolling hills of the beautiful Irish countryside. Until I’m able to book my trip to Dublin, I’ll have to settle for running and beer, which both have a long and storied history in Ireland! You can’t go wrong with a sponsor like this! After “getting lucky” and setting a PR at the Little Rock Marathon a few weeks back, I was excited to head up to Minneapolis for the Get Lucky 7K. I’ve run numerous Team Ortho races in the past, and completing the full “Monster Series” was a fantastic experience, so I knew the Get Lucky race would be no exception. However, this race had the added significance of being the first 7K race for the beautiful epicurean! Now, I know I haven’t been running all that long myself in the grand scheme of things. I think it can be easy to forget the basic joys and motivations of running when you are caught up in the details of training and preparation for the next race. Ok, at least that’s the case for me. However, for the past two and a half months, I’ve gotten to watch the beautiful epicurean return home from run after run, each time more happy than the last. Sometimes its beautiful outside, sometimes its dreary or snowy or dark, and sometimes her body feels great and other times her legs feel like lead weights. Throughout it all though, is the glint in her eyes that comes with something new and exciting. The glint of joy and personal accomplishment is unmistakable and its an absolutely beautiful and breathtaking sight. Ready to start…in 45 minutes. We took that motivation and energy up to Minneapolis, excited to toe the line for her first 7K. We left in plenty of time, but ran into some traffic as we got closer to the starting line. I was worried that we’d be late for the start, so she got out of the car and headed for the start while I parked the car. I got the car into the ramp and sprinted for the starting line. Luckily, the reality of 10,000 + runners meant they were releasing people in waves, so I had plenty of time to find her among the crowd. We ended up waiting about 45 minutes before we crossed the timing pad, and we were off! I ran with her for about the first mile. The crowd had separated, and we were moving along really well. She was looking and feeling strong, and it was such a wonderful experience to be running alongside her during a race! After that, she turned me loose and I headed on ahead. 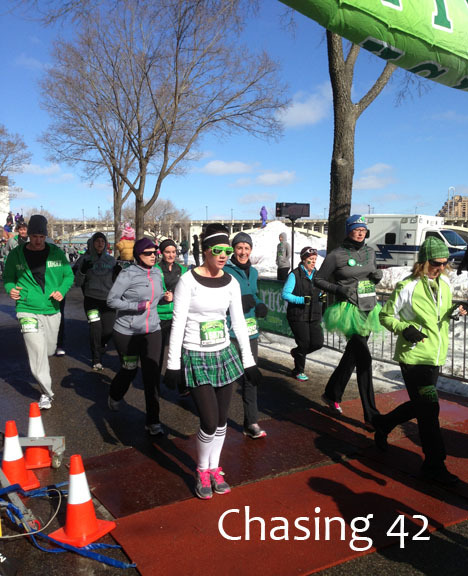 I was determined to push myself hard enough to make it to the finish line with plenty of time to get situated so I could get a picture of her crossing the finish line. The roads were a lovely combination of ice and slush after some rather cold weather (surprise, right?!? 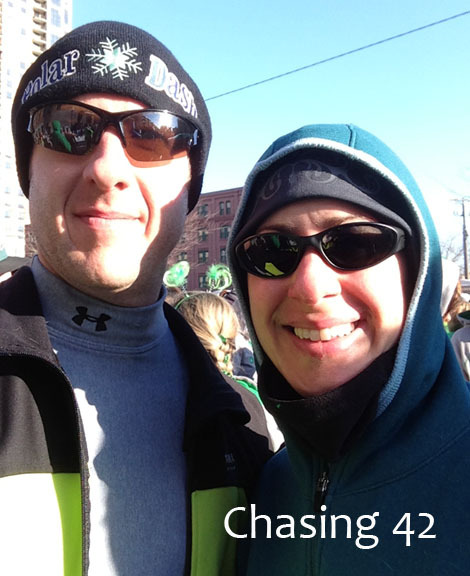 ), so I minded my footing but pushed myself in the cold air (about 22 at the start). Crossing the finish line, surrounded by other runners! I crossed the finish line and was able to step off to the side and work my way into position for a perfect view. I knew she was feeling good on race morning, and she had a great final training run a few days prior, so I knew she was going to have a great race. However, she still surprised me with her pace and energy! She was all smiles at the end of the race, just like every other run, and the mark had been set. We walked up the path, through the crowd, and claimed our medals together, passing by the frozen cups of water (Mother Nature’s way of encouraging us to drink more coffee! ), and headed for the car. Proudly showing off her first race medal! I’ve had the post-race conversation with countless friends in the past, recounting the details of the race and recapping how well we thought the race went. However, this was the first post-race conversation I’ve had with my partner, so it held so much more meaning. She has been such an incredible support structure for me through all of my training and races, and the opportunity to now return the favor is quite gratifying. I have no doubt that we have many miles and races ahead of us, and I couldn’t be more proud or more excited to be able to run them together! I’m sure you have all been eagerly awaiting the updates on my much-anticipated trip to Trinidad and Tobago. This was my first experience with international travel and it was an absolutely amazing experience. 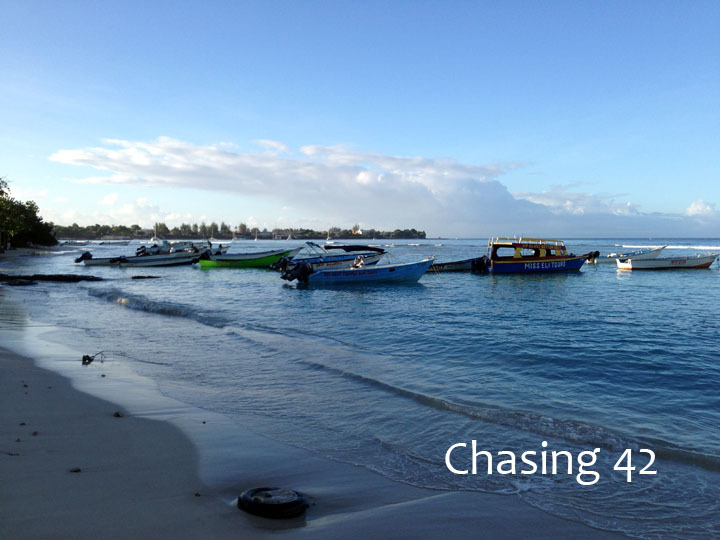 Thus, the next several posts will be dedicated to a more in-depth running recap of our week in the Caribbean. After the cold and snow this winter has brought, 85-degree temperatures and sunshine provided a well-timed week of relief! 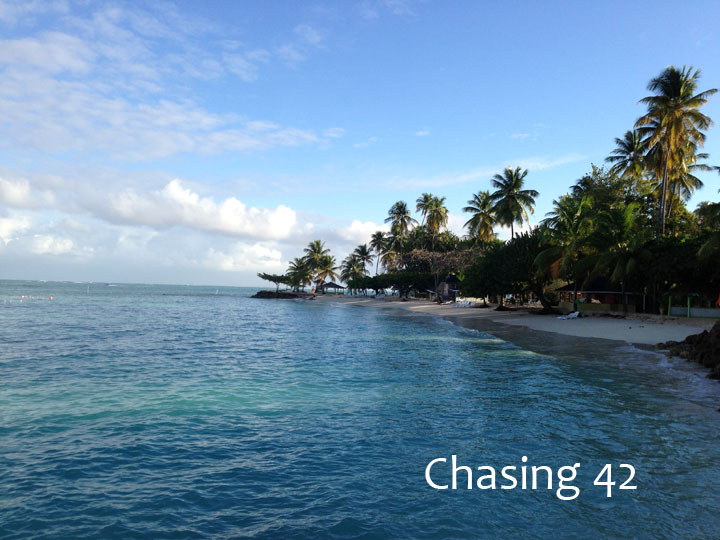 Two of our first days were spent on Trinidad’s sister island of Tobago. 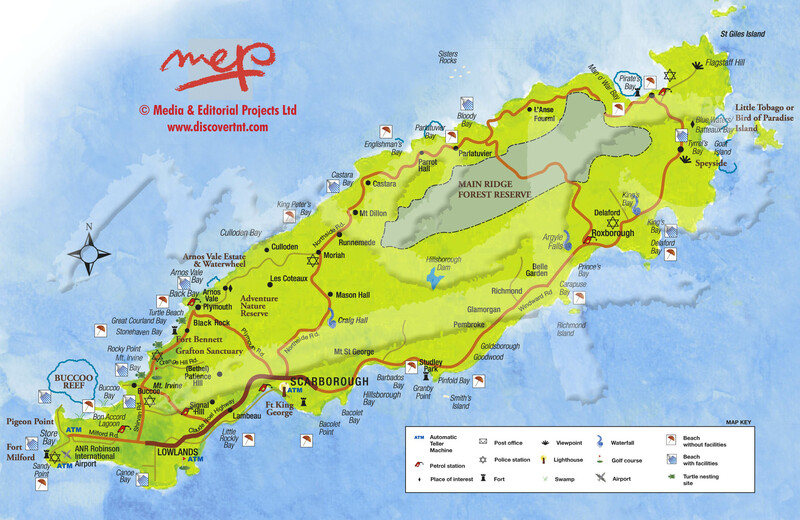 Despite being so close, the two islands have very distinct cultures and natural wonders. We took a quick 20-minute flight over and set up shop in a small hotel near the airport, and more importantly, the beach! We of course immediately dropped off our bags and headed for the beach, and it did not disappoint. The sand was clean and smooth, the water was a beautiful shade of blue, and small boats and glass-bottom tour boats lined the shore. Small bars, and homegrown food vendors were everywhere, and we definitely ate our way around both islands quite thoroughly. You can check out the upcoming posts from the beautiful epicurean for reports on our culinary adventures. The roads were quite narrow and the drivers quite agressive, so if I wasn’t running on a path, beach, or sidewalk, I wasn’t running! 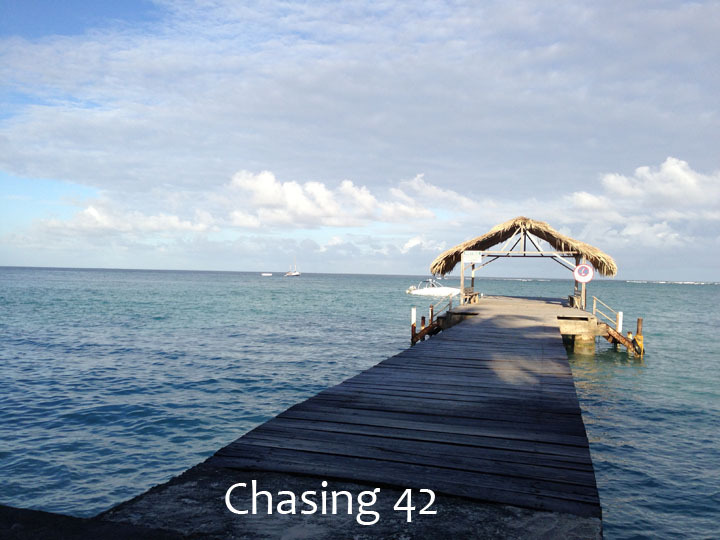 I normally cringe at getting up early to head out the door for a run in January, but that was far from the case in Tobago. I was out the door by 7AM, and I of course headed straight for the beach. 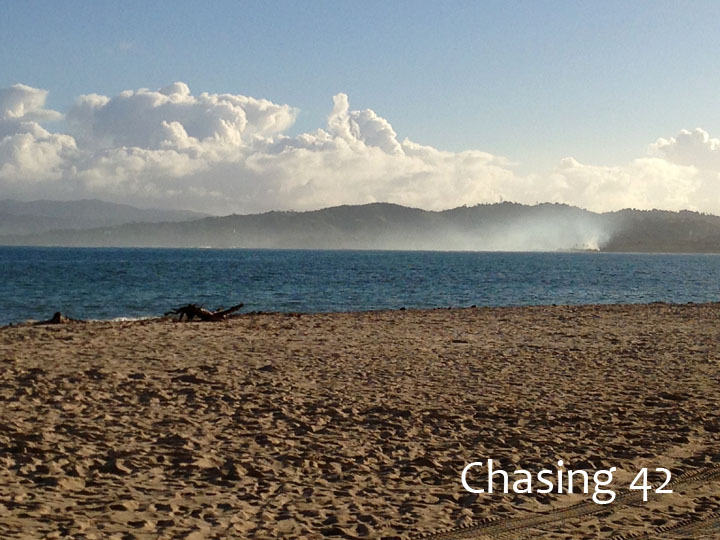 I ran past the beach on Store Bay, and down to Pigeon Point. This is a private beach that usually requires an admission fee, but the beach didn’t open until 9AM, and the security guard let me run in and explore. I pretty much had the entire beach area to myself and it was absolutely amazing! I’ve never seen such beautiful views and I felt as though I was on a completely different world. As I ran down along the beach and looked out into the Caribbean Sea, I was pretty sure I could have stayed there forever and run the same route. I’m sure it would have gotten old eventually, but at the time, I couldn’t imagine when. I did eventually leave my beach-front view and ventured further inland to explore the island a bit more. One of the main reasons I love running in a new location so much is the visual stimulation in the environment around. Tobago did not disappoint and I soaked in the scenes. Everything from small store fronts to children in uniforms heading to school to the daily hustle of the beginning of the work day caught my eye as I made my way. I made it back to the hotel to shower, and head out for a wonderful day relaxing on the beach and exploring the Buccoo Reef in a glass bottom boat. If only every run and every day could be so wonderful 🙂 Stay tuned for the next installment of the T & T Chronicles! Coconut Bake & Flying Fish- a perfect T & T breakfast treat after a hard run!